Charge your battery conveniently anywhere. This B&H Kit includes the Watson Compact AC/DC Charger and an interchangeable Battery Plate for Panasonic CGA-DU Series type batteries. The Compact Charger features a fold-out U.S. plug and is small enough to fit in your pocket. It supports a 100-240V worldwide power input and comes with a European plug adapter and standard car lighter adapter, so you can rely on it at home, on the road, when you're traveling, and for your international projects. It also features a USB port for charging your mobile devices wherever you are. 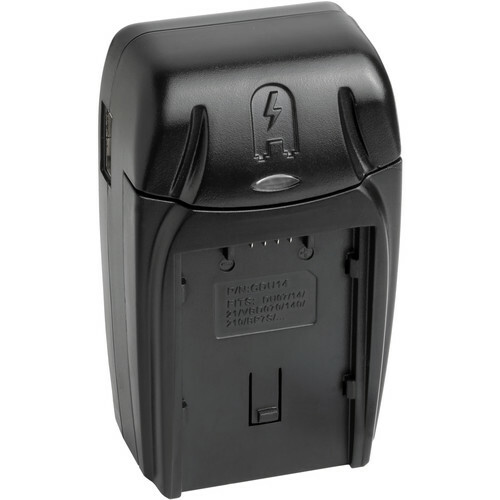 The Compact AC/DC Battery Charger from Watson charges many different batteries using dedicated interchangeable plates, which are required and available separately. The charger runs on 100-240 VAC power, allowing for worldwide use. It features a fold-out 2-prong US plug and is supplied with a European plug adapter, as well as a 12 VDC car charger that plugs into a cigarette lighter. This makes it ideal for use both at home and on the road. The Compact AC/DC Charger features a USB power output that allows you to charge and power MP3 players, phones, digital cameras, and other devices with a USB power input - even while charging your camera or camcorder batteries. Features a fold-out AC plug for easy storage and travel. Includes a Euro plug adapter for charging in Europe and a DC adapter with cigarette lighter plug for charging while on the road. Charge or supply power to MP3 devices, mobile phones, digital cameras, and other related devices with a USB power input. Protection against overcharging and overheating. The Watson Battery Adapter Plate for CGA-DU Series enables you to charge any Panasonic CGA-DU06, CGA-DU07, CGA-DU12, CGA-DU14, or CGA-DU21, or Hitachi DZ-BP07, DZ-BP14, DZ-BP14S, or DZ-BP21 type battery using your Watson Compact AC/DC or Duo LCD Charger. Box Dimensions (LxWxH) 6.8 x 4.0 x 2.8"
Box Dimensions (LxWxH) 4.3 x 2.3 x 0.9"